Britain’s Prince William and Kate, Duchess of Cambridge hold the Prince of Cambridge, Tuesday July 23, 2013, as they pose for photographers outside St. Mary’s Hospital exclusive Lindo Wing in London where the Duchess gave birth on Monday July 22. The Royal couple are expected to head to Londons Kensington Palace from the hospital with their newly born son, the third in line to the British throne. (AP Photo/Lefteris Pitarakis) Kate, Duchess of Cambridge holds the Prince of Cambridge, Tuesday July 23, 2013, as they pose for photographers outside St. Mary’s Hospital exclusive Lindo Wing in London where the Duchess gave birth on Monday July 22. The Royal couple are expected to head to Londons Kensington Palace from the hospital with their newly born son, the third in line to the British throne. (AP Photo/Alastair Grant) Britain’s Prince William and Kate, Duchess of Cambridge hold the Prince of Cambridge, Tuesday July 23, 2013, as they pose for photographers outside St. Mary’s Hospital exclusive Lindo Wing in London where the Duchess gave birth on Monday July 22. The Royal couple are expected to head to Londons Kensington Palace from the hospital with their newly born son, the third in line to the British throne. (AP Photo/Lefteris Pitarakis) Britain’s Prince William and Kate, Duchess of Cambridge hold the Prince of Cambridge, Tuesday July 23, 2013, as they pose for photographers outside St. Mary’s Hospital exclusive Lindo Wing in London where the Duchess gave birth on Monday July 22. The Royal couple are expected to head to Londons Kensington Palace from the hospital with their newly born son, the third in line to the British throne. (AP Photo/Lefteris Pitarakis) Royal Baby The Duchess of Cambridge, Prince William and their newborn son pictured outside the Lindo Wing at St Mary’s Hospital, London. 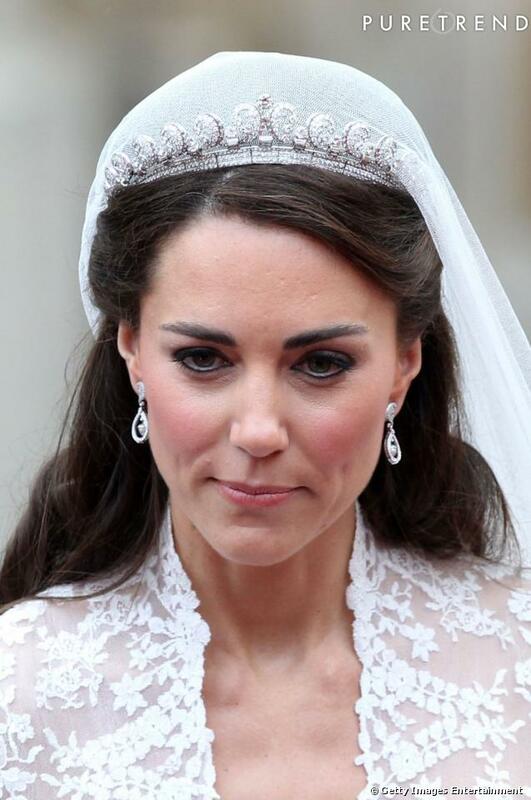 There have been and will continue to be many post-baby “firsts” for Kate Middleton. Her first family portrait ! Her first sans-baby outing ! Her first “official” appearance ! And so forth. But tonight is surely the most glamorous of such debuts, as it involves a shimmery gown, a red carpet, and a gala the kind of royal trappings that us normal folks love to gape at from afar. For the Tusk Trust gala, which raises money for land and animal conservation in Africa, she wore a long, silver gown by Jenny Packham (who showed many princess-worthy gowns on her runway just two days ago ), the same designer who custom-made the dress she wore home from the hospital with newborn Prince George. It’s probably the sparkliest thing she’s ever worn can you think of a time she’s worn head-to-toe sequins before? but it was still conservative in cut, with a modest neckline and a lace inset in the back. She also wore silver Jimmy Choo platform heels and a diamond bracelet. During a brief speech, Prince William said it was their first time leaving Prince George with a babysitter (they selectedJessie Webb, the 71-year-old former nanny to William and Harry, for the job), adding, “Excuse us if you see us nervously casting surreptitious glances at our mobile phones.” Aw. But wait! They carrycell phones? Isn’t that what the Helps are for? The Duke of Edinburgh is the last senior royal to be introduced to the little one. Now 92, the Queen’s husband had a difficult summer after having an exploratory operation on his stomach and spent two months recuperating at Sandringham, meaning he missed all the excitement over the baby’s arrival. The Duke and Duchess of Cambridge have taken their son to meet his great-grandpa William and Kate landed at Aberdeen airport on Sunday following the Duke of Cambridge’s attendance at a glamorous society wedding with Prince Harry and Pippa Middleton. A source told the Daily Mirror: “This was an incredible moment for Philip. “He has been desperate to meet his great grandson and having the family together is really special for him.” The young family were driven from the airport to Balmoral Castle where the monarch is now on her traditional extended summer break. Prince Charles and Camilla are staying in nearby Birkhall, their manor house on the royal estate. The get together provides a rare opportunity for three generations of royal heirs to be pictured with the Queen: Charles, William and George. The last time this happened was when Queen Victoria was photographed in 1894 with her son who became Edward VII, grandson later George V and great-grandson, who reigned briefly as Edward VIII. 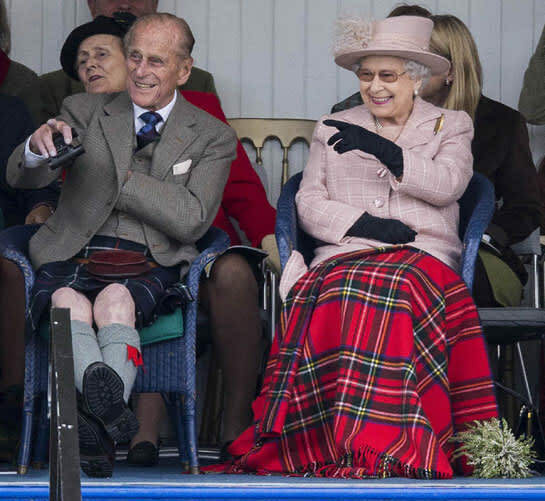 It will be a real treat for Prince Philip seen here recently at the Braemar Games Prince Philip is said to be in good health and often goes out on grouse shoots as an observer. While he doesn’t shoot himself, the outings which last up to half a day allow him to get some exercise and fresh air. The Cambridges have been quite busy since George’s arrival seven weeks ago. They spent the initial time after his birth at the Middleton family home, before heading for Anglesey where William wrapped his tour of duty as a search and rescue pilot. The white-washed cottage where the couple lived for three years is now up for rent . Home from now on will be luxurious apartments in Kensington Palace. Kate is now settling back into life in London and put in a dazzling appearance at her first official public engagement last week, wearing a sequinned Jenny Packham gown.